Stock # 10888, 3.3 Liter Aircooled Turbocharged, Manual, 52462 mi. 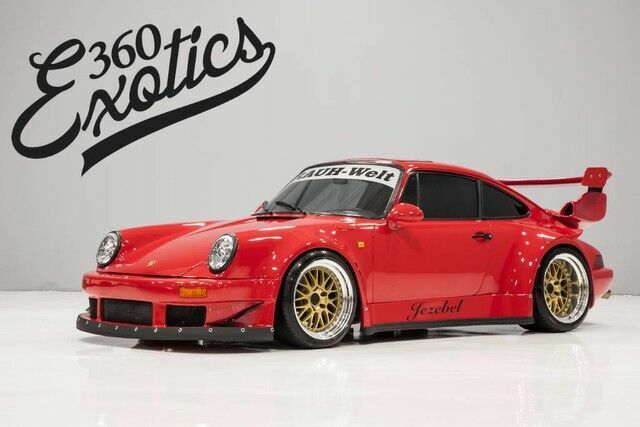 360 Exotics is proud to offer this one of a kind RWB 911 Turbo that is unlike anything else available for sale in the world. This particular RWB features key build components that make it one of the most highly sought after 911 RWB's ever created. For starters just the fact that this car was built on a highly sought after 930 Turbo (most other RWB builds use the less popular naturally aspirated 911) is just another example on why this car is unlike anything else available. RWB – RAUH-Welt BEGRIFF (Rough World Concept) was founded by Akira Nakai and is world famous in custom bodywork for air-cooled 911 Porsches. Each RWB creation is built with form and function. Nakai admittedly builds his Porsches mainly for the way they look. The added functionality of a wide-tire Porsche, though, is welcomed. He is no stranger to the track, and he and his Japan-based customers often assemble for RWB-only track events on circuits like Tsukuba. In fact, many customer cars are purpose-built track toys as is Jezebel. The Jezebel RWB initial iteration was built in 2008 and is a rare version where he molded the fender flares rather than bolting them on providing a much cleaner and elegant look. The original name was Rainbow named after the famous Rainbow span bridge in Japan. The subsequent owner renamed it Kingfisher until this final version…Jezebel! -Elephant Racing GT3 front cross-member and lower control arms. -Tubular body through bladed Elephant Racing front sway bar. -Elephant racing rear spring plates.